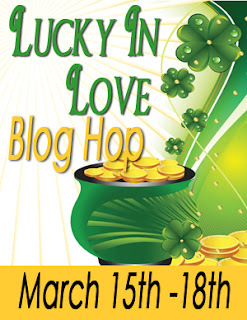 Welcome to my stop for the Lucky in Love blog hop! I love this time of year. St. Patrick's Day makes me think of the Irish with faeries and leprechauns. Although, NOT the horror movie kind. Yeesh! I've also had some fond memories of a huge 64 oz green pina colada shared with my hubby after a St. Patrick's Day parade a few years ago. Each year, I try to wear green; however, most of the time, I forget. What are your plans for St. Patrick's Day? Will you be wearing green? To be entered into my giveaway (an eBook from my backlist), please leave a comment with your email address! Also, there are grand prizes for the hop. All comments across the blog hop are entered. For more information on that, click here. Congrats to Shelly H for winning an eBook from my backlist!! Yes, I will be wearing green and that's about all we do for St. Patty's. Thanks. I won't be wearing green, or going out (very dangerous!) but I have a very nice bottle of stout that I plan to enjoy. I only wear green if I wear my black, red and green Marley hat--green is not my color at all, lol! I will wear green but I will not go out. I will definitely be wearing green! and finding green beer! This year, I think my daughter and I will make mint chocolate chip cookies! We will most likely wear green. No plans for St. Patty's. Many years we don’t really do much of to celebrate aside from watching parades on TV. Generally it's too cold to find them out in the really real world but on TV works! This year, however, we will be going to my one and only sisters house for a bit of a feast. She loves to cook and bake (and does both very well) so she is going to go all out making all sorts of “Irish” type things she finds recipes for online and many other things. It should be fun. Yeah, I'm wearing green all day! :D Hope it brings me some luck! No plans. I usually do wear green. I usually wear green and go to an Irish pub with my friends. No plans, I stayed home with family. The only thing I do for St Patricks day is wear green. I'd love to go to Ireland, too, though the only thing I do for St. Patrick's Day is to wear green. I got lucky in love, i met my husband when i was in high school and we've been together for 15 wonderful years!